Pick & Choose (F.G.) Ltd. Publisher: Pick & Choose (F.G.) Ltd.
Chuckie Egg 2 is the sequel to 1983 hit computer game Chuckie Egg. 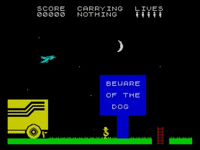 Released in 1985 and featuring the same lead character, Henhouse Harry, the game took players beyond the single-screen format of the original into a large factory. Here, Harry had to assemble a toy-carrying chocolate egg from its constituent parts (sugar, milk and cocoa powder) and deliver it to the dispatch lorry. On completion the quest restarted, with more monsters and an alternative toy. Source: Wikipedia, "Chuckie Egg 2," available under the CC-BY-SA License.